The new Executive Secretary of the Inter-American Commission on Human Rights (IACHR), Emilio Álvarez Icaza, today expressed before the Permanent Council of the Organization of American States (OAS) his willingness to establish a relationship "on the best terms" with the Member States of the hemispheric organization. 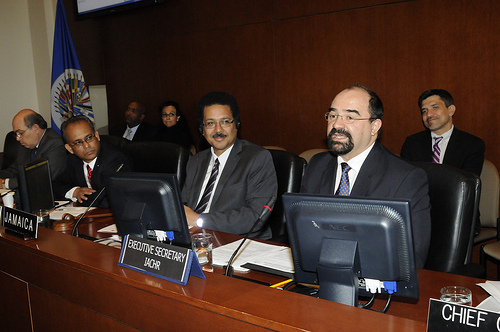 During his first address to the Permanent Council, Álvarez Icaza said that “we are more than willing to generate operational synergies with the Member States,” in line with the position taken by the Secretary General of the OAS, José Miguel Insulza, at the last Permanent Council meeting on the subject. “We want to work with each of the Member States in reviewing cases that they have, and also in reviewing processes to help us generate synergies which allow the points of common interest to be addressed,” added Álvarez Icaza, who took office on August 16. The IACHR Executive Secretary explained that the Commission has established three major stages in the context of the ongoing process of the strengthening of the Inter-American System of Human Rights, which is being carried out in compliance with the mandate adopted by the General Assembly held in Cochabamba in June. The first consisted of seminars in Colombia, Chile, Costa Rica, Mexico, and Trinidad and Tobago, where representatives of civil society, victims and public officials took part. Álvarez Icaza said that in the seminar in Colombia, Colombian President Juan Manuel Santos took part, while at the seminar in Mexico, the Foreign Minister of Ecuador, the Deputy Foreign Minister of Venezuela, and the Undersecretary for Multilateral Affairs and Human Rights of Mexico all took part. The third stage mentioned by the IACHR Executive Secretary refers to the participation of the OAS Member States in a "formal hearing" of the Commission on October 30, to be held within the framework of the next session of the IACHR. On another issue, the IACHR Executive Secretary referred to the “genuine budgetary limits” of the Commission and, referring to the debates being held by the Permanent Council on the organization’s 2013 budget, expressed his thanks for “the will you may have to advance a message of making human rights a priority,” as has been mentioned “initially by the Secretary General” Insulza. The representatives of Chile, Guatemala, the United States, Haiti, Peru, Brazil, Canada, Honduras, Mexico, El Salvador, Colombia, Panama, Costa Rica, Argentina and Bolivia all participated in the meeting of the Council.